Man y apologies for being slow to update. Believe me, there is more, and there will be more – I’ve been busier than ever. However, here’s a quick post to tide us over until the next! Whenever we hit 100°F/38°C temperatures in the Los Angeles area, with weird, unseasonable humidity, lightning flashes, and brush fires, I inevitably turn to the popular and dance music from places even warmer. This time, I turned to Colombia – a country I’ve never posted a 78 from, until now, but whose music I’ve always found irresistible. Colombian music began appearing on 78rpm quite early. American labels, such as Victor (who had perhaps the largest presence in South America in part due to an early agreement with the British Gramophone Company, which effectively split the world’s markets between them, acting as independently operated sister companies), Brunswick, and Vocalion, all released Colombian musical styles. In my mind, however, it wasn’t until the independent labels of Bogotá began cropping up that intense Colombian dance music began its true heyday. 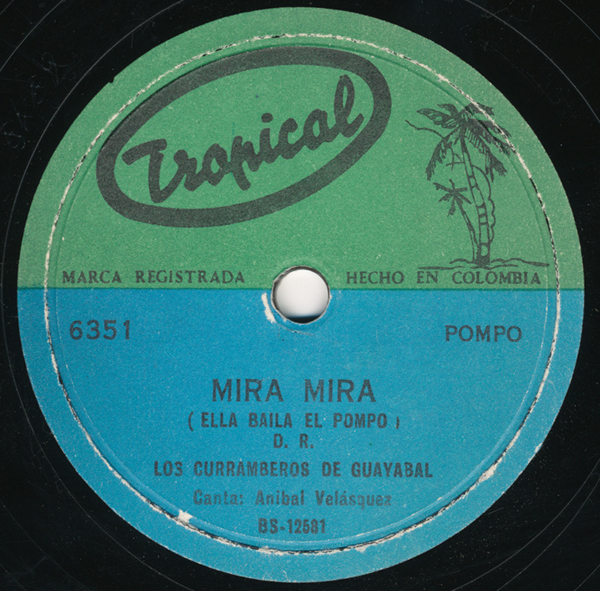 Labels like Lyra, Tropical, and of course, the famous Discos Fuentes, released thousands of both urban and more rural cumbias, porros, and vallenatos, well into the 33/45 rpm era and beyond (in fact, it’s probably far more common to find these songs on 45s rather than 78s these days). With cumbia seeing such a massive and well-deserved resurgence in the past few years, I thought it would be fun to post a a different genre, a pompo, instead. It is well-played, simple, repetitive, and fun. The accordionist from Barranquilla, Anibal Velasquez Hurtado, is one of the most well-known musicians of Colombia. Born in 1936, Velasquez began recording in 1952. Los Curramberos de Guayabal recorded in the early to mid-1960s, I believe – there are several of their LPs (collections of singles) floating around the internet if you dig hard enough. If you’d like to know more about Velasquez, the fine folks over at Analog Africa have an interview and a CD available – see here. Great to find your blog JW. Please keep me posted on the Colombian recordings. need your help. You know the name of this song and the the orchestra. remember has submitted in your blog some Arabic music. I wonder if the melody is Arabic. discos fuentes, the most ancient label from the south am, founded 1934 by the friendly toño fuentes kept releasing 78`s till late sixties (in vinyl format), the same phenomena heppened in the entire south am included chile (where this post come)where the format dissappeared in early seventies. highly recommended also the venezuelan label called turpial records extracting the raw african influence. really invited to listen a radio show called “the night of the livind records” (la noche de los discos vivientes) at http://www.radiovalentinletelier.cl where podcast can be dowloaded. great tune! what year was it released?